Even though Cataclysm isn’t out yet, Blizzard is already planning the fourth expansion for World of Warcraft. 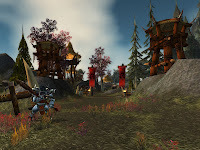 John Lagrave, Senior Producer on the MMORPG, said that there’s a central theme for the next expansion that is exciting him and the rest of the team. Any idea of which theme this could be? World of Warcraft: Cataclysm will launch on December 7th.